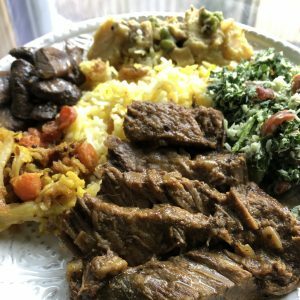 This dish translated really easily to the Instant Pot — I hardly had to modify it at all. And it’s simple enough that even a novice cook shouldn’t find it too intimidating. It normally takes 4-6 hours by the traditional method, but this was just an hour, start to finish. Maybe add another 10-15 minutes if you’re slow at chopping onions, but still — v. speedy, and I didn’t notice any lessening of flavor from the traditional version. This is a dish of Dutch / Sri Lankan origin. Yummy with rice — also great in weekday lunch sandwiches on hearty Italian bread, or shredded into a pita or folded naan, with some pickled onions and a little yogurt. Long-handled metal tongs will help with moving the large piece of hot meat. This is made to authentic Sri Lankan spice levels; reduce chili powder for a milder version. Delicious with a deep red wine; garnish with cilantro if desired. A fabulous dinner party dish. 1. Set Instant Pot on sauté and heat oil. 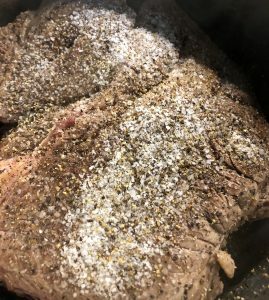 Rub beef with salt and pepper, then sear the beef until lightly brown on all sides, which adds great depth of flavor to the sauce. 2. 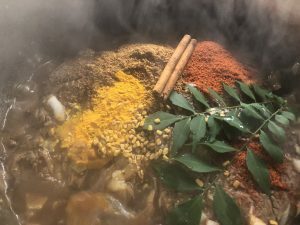 Add the vinegar, tamarind water, onions, garlic, ginger, cinnamon, curry leaves, lemongrass, curry powder, chili powder, turmeric, fenugreek, remaining salt, and coconut milk. Stir to combine, scraping up any browned meat on the bottom of the pan. 4. Cover the Instant Pot and set to pressure cook for 45 minutes. When finished, release steam and then remove lid. 5. 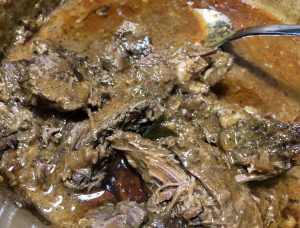 Remove meat to a serving dish; if the gravy is too thin, reduce it by boiling rapidly uncovered. Transfer gravy to a serving bowl. Slice the meat into the desired thickness, and pour gravy over the slices; serve hot with rice or bread.